One of my favorite tools for the past couple of years has been a web developer’s reference guide from Visibone. The book has rarely left my desk, within arm’s reach, to help out when I just can’t remember all the options for an HTML tag or a CSS style. While there are some great online references, having it all in a couple sheets of paper makes it easy to find what I’m looking for (especially if I couldn’t remember if it was text-something or font-mumble) and the reference has also let me browse around the dusty corners and learn something I didn’t know. There are a number of bonus references available on the Visibone site at no cost. Check out the color lab, the color swatches for many of the common graphics programs, the online color codes reference, and excerpts from all of the various reference materials. 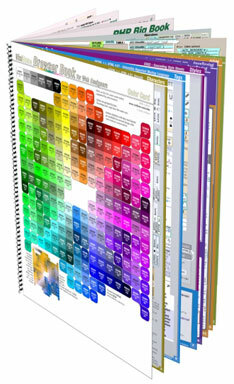 In addition to reference book, Visibone offers posters, charts and mouse pads. The web site is worth a visit; it’s charmingly quirky, retro, opinionated and clearly individualistic.